New public opinion polls have sunk to new lows for Prime Minister Erna Solberg’s newly expanded government, just as one of its Members of Parliament was arrested by police. After a year of scandals around politicians from several parties who’ve behaved badly and defied the public’s trust, concerns are rising that voters can lose confidence in politicians and the Parliament itself. Voters clearly aren’t impressed with Solberg’s new four-party right-center coalition. 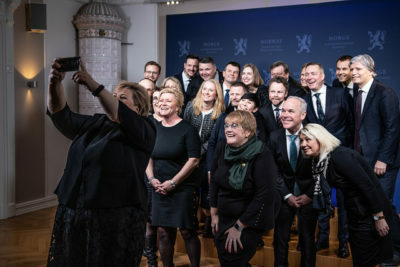 Newspaper Aftenposten and Norwegian Broadcasting (NRK)’s new joint poll shows the worst numbers for the government since Solberg became prime minister in 2013. All four of the non-socialist parties in her government fell in the poll, her own Conservative Party the steepest. Solberg’s party now holds just 22.9 percent, down 4.1 percentage points from the last poll conducted for Aftenposten and NRK by research firm Norstat. Her biggest government partner, the Progress Party, also slipped again and now holds just 12 percent of the vote. That compares to the 15.2 percent it won in the last election and the 20.9 percent it won back in 2009, when it was bigger than the Conservatives. Worst off is the ever-shrinking Liberal Party, who joined the Conservatives’ and Progress’ minority government just over a year ago but has won no voter support for its new government power. On the contrary, the Liberals’ have lost voter support and now hold just 2.6 percent of the vote. “That’s a crisis for (party leader) Trine Skei Grande’s Liberals (Venstre),” said NRK’s political commentator Lars Nehru Sand on Wednesday. Her party, which won 4.4 percent of the vote in the 2017 election, has been stuck under the 4-percent limit for winning extra seats in Parliament all year long. The Christian Democrats, which joined the government just last month after a dramatic split within the party, slipped as well in the latest poll, now holding just 3.4 percent of voter support. It all means that even though Solberg now leads a “majority” government based on the last election results, voter support at present leaves her with a clear minority. Her government would win only 40.9 percent of the vote if an election were held today, while the three left-center parties (Labour, the Center Party and Socialist Left SV) would win enough seats to have a majority on their own. They’d likely also gain support on a wide range of issues from the Reds, which now holds 4.8 percent of the vote, and the Greens, which holds 3.2 percent. Labour emerged as the single biggest party in Parliament, with 29.2 percent of the vote. The Center Party ranks as the second-biggest opposition party with 11.8 percent and SV holds 7.8 percent. That puts them all in a much better position than the government parties as they all head into local elections this fall. Some commentators see Solberg’s fall from grace as mostly a result of voter fatigue midway into her second term. Her coalition has also been plagued by its share of sexual harassment charges against its parties’ politicians, and some particularly bad behaviour by MPs for the Progress Party. Progress Party leader Siv Jensen stated this week that the fraud and, most recently, threat charges against her own susbstitute in Parliament, MP Mazyar Keshvari, have been “embarrassing” for his party colleagues and not least those who are elected officials. Keshvari is currently back out on sick leave, with former Progress Party leader Carl I Hagen stepping in this week as Keshvari’s substitute in Parliament. The fact that Keshvari and other errant MPs aren’t allowed under the constitution to either resign their posts or be fired is now becoming an issue itself. MP Morten Wold, also from the Progress Party, thinks it’s time to amend the constitutional point that all but forces MPs to serve out their four-year elected terms. Wold thinks MPs should be allowed to resign, out of consideration both to themselves and the reputation of the Parliament. MP Per Olaf Lundteigen of the Center Party, which has suffered its own humiliating harassment charges, thinks the Parliament as a whole should be able to dismiss MPs if they’ve convicted of a crime. At present, the only time an MP can be relieved of his or her duties is through illness, death, defection to a foreign country or the offer of an international top job that would serve Norway’s interests. 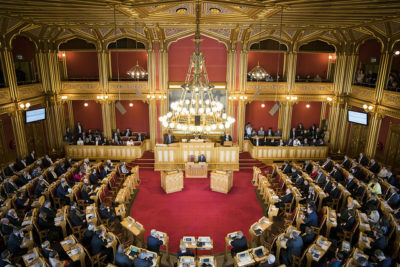 Tone Wilhelmsen Trøen, who as president of the Parliament ranks second only to the monarch in Norway, is also concerned about recent scandals that also have included the Parliament’s own major construction project that resulted in massive budget overruns. She told NRK this week that the credibility of both elected representatives and the Parliament itself can be damaged when MPs get into serious trouble but continue in their positions. Others are skeptical to any constitutional changes. Newspaper Dagsavisen editorialized on Wednesday that MPs are not above the law and must serve any prison terms they’re handed (Keshvari currently faces six years in jail on the fraud charges against him). “But when the sentence is served, the voters must decide if they still have confidence in the person at the next juncture,” Dagsavisen wrote. Otherwise, the political parties can use their power to squeeze candidates out, and the voters would be undermined.